G and Sagat were just revealed. G seems like I thought he would be, like Q before he was a cyborg. Maybe part of his story mode or maybe just an OOC callback, we’ll see. He “Gets his power from the earth”, and is nicknamed “President of Earth”. Also he has a golden map of earth tattoo. It’s not clear yet if he’s actually an earth elemental or if he gets his power from the PEOPLE of earth in the form of patriotism or something stupid. One of his alternate outfits is Q.
Sagat just seems like Sagat. 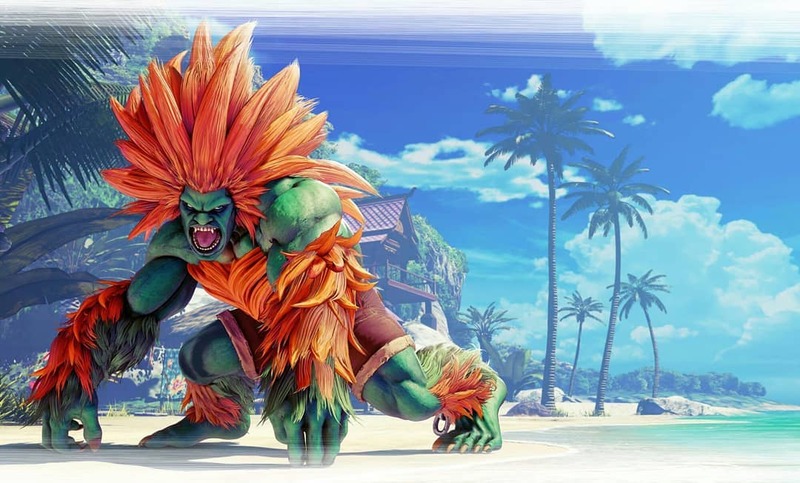 The full Blanka trailer has been released! SFV Season 3 Cast Revealed! 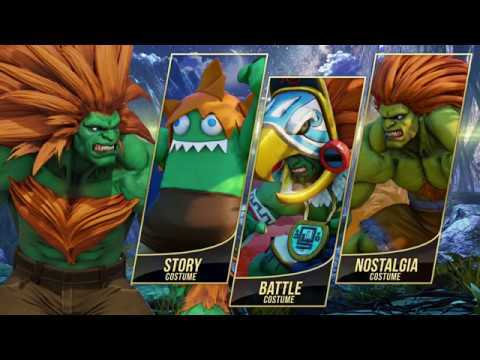 Zeku has been added to the Street Fighter V cast, you may remember him as Guys master from Street Fighter Alpha 2. He’s back, he’s old as hell, and he has the ability to transform into his younger self which looks exactly like Strider Hiryu?! Menat has been revealed for SFV. You may recognize her as the fortune teller from Ed’s story mode. She is an apprentice of Rose and seems to use a variant of the same fighting style, including Soul Reflect and several other magical orb attacks. She’s short and has an Egyptian motif. She seems to fill the “magical girl” character slot, like Ingrid, or KOFs Athena. During Evo finals Capcom revealed the newest SFV cast member, Abigail. You may remember him from Final Fight. Below are his official art and trailer video, I will update this space with more info as it becomes available. 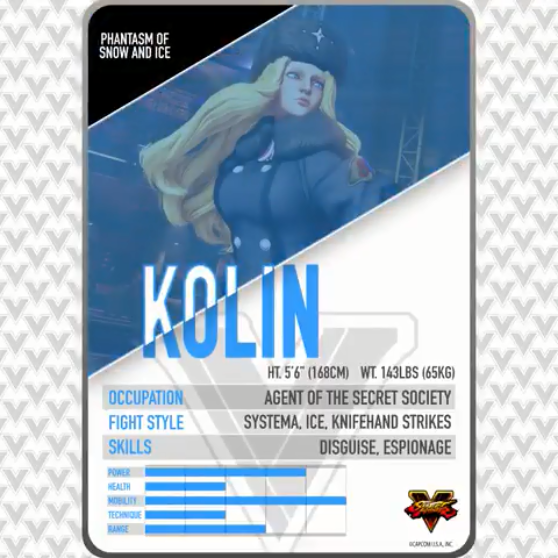 Kolin (pronounced “Coleen”) is officially a full fledged fighter now, not just Gill’s personal assistant. We are happy to announce the second Season 2 Street Fighter V character, Kolin, is coming February 28th. After working in the shadows for Gill and the secret Illuminati organization, Kolin makes her Street Fighter V debut. First appearing in Street Fighter III, Kolin works behind the scenes in order to fulfill the Prophecy of Miraha and stop any who dare stand in Gill’s way. She is typically calm and collected, but can suddenly fly into a rage when anybody threatens Gill and his plans. Spoiler-alert, she resurrects Nash and uses him as a pawn too, showing she will do anything to achieve her goals. 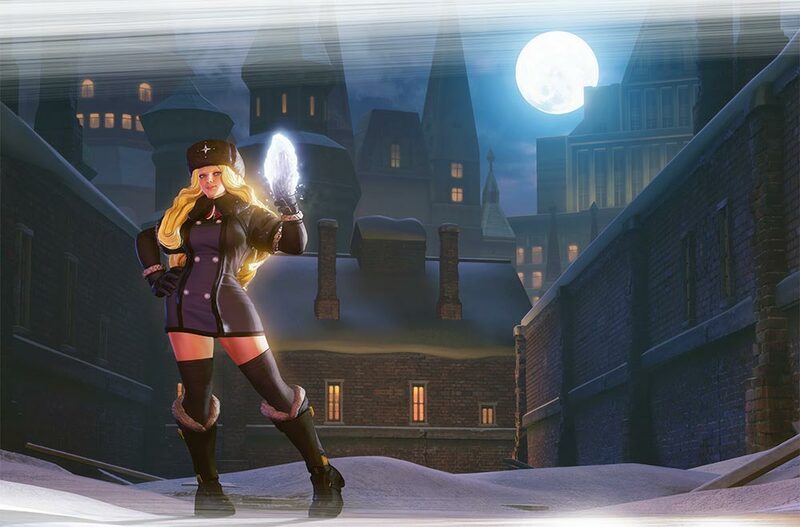 Kolin excels in the Russian martial art of Systema, utilizing the opponent’s momentum against them and executing various slash-like attacks and knife hand strikes. Gill has bestowed upon her the power of ice, allowing her to augment her fight style with frigid blasts and deadly icicles. She is often heard speaking condescendingly towards her opponents, knowing they don’t stand a chance before her, let alone Gill. Where did her hatred of Shadaloo come from and how did she originally become involved with Gill? Be sure to check out her character story to find out! She has ice powers, which may change how I have to implement Gill and ice in general going forward. Previously I had ruled that Gill could use fire and ice because the ice formed due to the absence of heat, similarly to Earth elementals using Pit (absence of earth), air elementals using Vacuum (absence of air) and water elementals using Drain (absence of water). That doesn’t really work anymore if she has ice powers but no fire powers. New style, Systema for me to create, and definitely some new moves as well!